The marathon began early this morning as I crawled out of bed around 5:00A.M to officially kick the new season. Last week, I scouted out east to see what the stream conditions were like and sure enough some fish started poking their way into the lower sections. However, like ever fall the streams were often low and gin clear. Earlier that morning, I was chucking spoons off the breakwall. The lake was in perfect condition, it had a nice chop and I could see endless numbers of shiners along the walls. 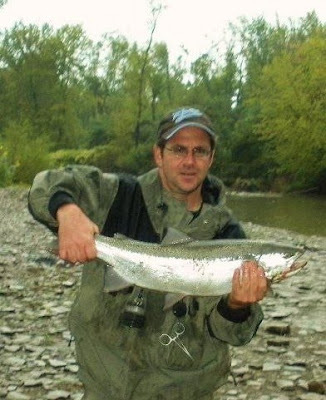 Usually the chop will push the bait fish out farther and steelhead often ambush them. I chucked for hours and posted a goose egg. Sometimes it's a case of being in the right place at the right time. I stopped by the stream and in some of the holes and pools, I could see several fresh steelhead holding in one very popular pool. They were ignoring the many offerings thrown their way by the latest batch of newbies hoping in vain to get a bite. This seasoned vet knew it was going to be fruitless and I knew better days laid ahead. This past weekend we got some rain and at times it was very heavy. I was hoping the rain would raise the levels high enough, but not enough to blow it out. Once we headed out of Cleveland, it pissed and poured all the way. The plan was to chuck spoons in the morning and then head down to the river if it sucked on the lake. We stopped at the river and noticed it was dirty, but very fishable with sacs. We decided to scrap the idea of chucking spoons and fish the lower sections. Since the water was off color I knew I had a chance, but I had no idea how many fish were in there. This was same pool at that last week was a clear as an aquarium. Once in while a fish would come up and taunt us. I had a jar of old cured coho eggs from last season. I fished the head of the pool and that tell tale sign of the float getting sucked under hard meant the first fish of the season. It was a large bright silver hen that smacked a chartreuse sac. As expected every year early in the season, fish can be few and far between. I managed to pick up probably one of the skinniest steelhead I've ever caught. This fish probably would of nailed strand of yarn or even a bare hook. Early this week, we received rain, cool temps and gusting winds - the kind of weather that brings a smile to a steelheader's face. 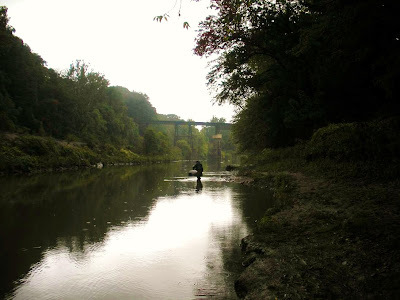 Beautiful, I just got my first fall steelhead last weekend on the Milwaukee river on the fly rod. A wonderful feeling to set the hook and see that silver bullet burst out of the water. I was going to head out today but had a case of the lazys.